Vincentians came to Eluru diocese of Andhra Pradesh in the year 1982. Fr. Joseph Palatty and Fr. Venattichry were the pioneers. In June 1982, Kannapuram was erected a Parish with seven villages and was given to the Congregation of the Mission. Staying in a rented building, the Fathers carried on the mission work and in 1985, the presbytery was blessed. 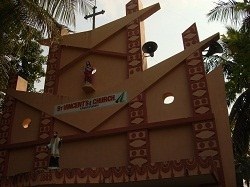 In 1986, Kannapuram was erected a Canonical House and Fr. Joseph Kizharam was appointed as the first Superior, even though he was the Parish Priest of Gauravaram an erstwhile mission station in Andhra Pradesh. The Parish church was constructed by Fr. John Pottankuzhiyil and was blessed in 1989. In December 1989, Fr. Jacob Chennakadan was appointed Superior and Parish Priest. During his time a health centre was built in 1993 and was entrusted it to the care of the Hospitaller Sisters of Mercy. He also built five village chapels. The Parish has about one thousand Catholics spread out in seven villages. Kannapuram is about 40 kms away from Eluru.